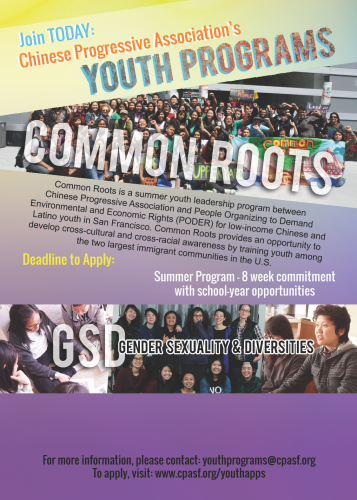 Chinese Progressive Association | Apply for Youth MOJO Programs this Fall 2018! Apply for Youth MOJO Programs this Fall 2018! It’s that time of year to apply to Youth MOJO programs! Check out the link here for our online application and for more info on how to apply!! Youth MOJO develops the leadership of Chinese high school youth in San Francisco, with a focus on social issues such as healthcare, education, immigration, and workers’ rights. Youth leaders develop leadership, communication, advocacy and organizing skills. Our program aims to empower youth to make a positive change in their community! Youth MOJO members are required to attend workshops every Friday from 5-7pm. BREATHE is a space for queer and questioning folks to unpack and explore our mental and emotional health, wellness, and healing. Through sharing personal stories, experiences, and the ways we survive, we will engage with topics such as depression, anxiety, body image, conflict, self-worth and other topics of youth’s choice. Through this gathering space, we aim to build and strengthen coping and resilience skills and strategies. The young men’s circle is a space for cisgender men to talk about Asian American masculinity, toxic masculinity, and how to use their privilege to address sexism and the patriarchy in spaces they are in.